Hey guys! Today I have the first half of the new Zoya Fall Collections, the Entice Collection, 6 beautiful full coverage crème polishes! For the second half, called the Ignite Collection, click here! 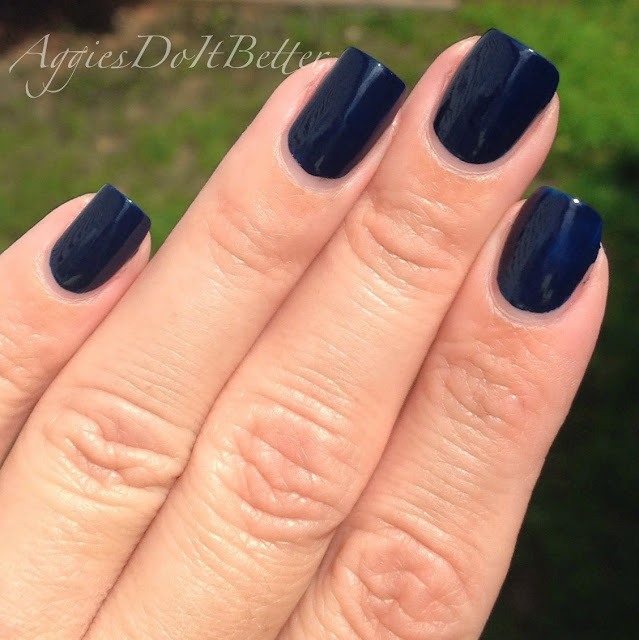 Click Read more after the collage for all the swatches! Here is the line up: aren't they so beautiful?? I mean, really. Out of the park! I am definitely a lover of jewel toned crèmes. So prepared for some gushing! I wanted to start with this...for my base I used my new Zoya Get Even ridge filling basecoat (purchased by me). I previously have been using a couple different kinds and when Zoya had their most recent promo I finally grabbed it up! Pretty happy with it so far! My nails are slightly ridgy, even with buffing. This is my absolute favorite type of basecoat to use, and I highly recommend it, even if you don't have ridgy nails. 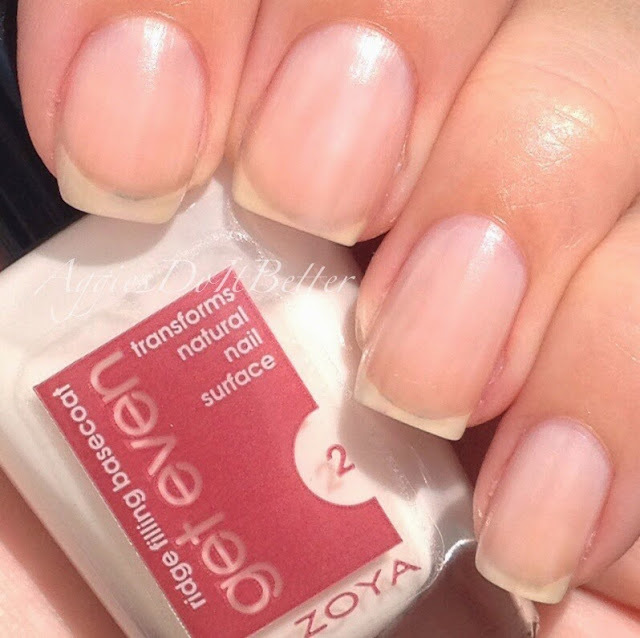 It helps with the opacity of sheer polishes and just makes everything go on smoother. So I thought I'd include a pic! First up is Veronica, described by Zoya as "a full coverage brilliant red wine". I think it's a little light to be a red wine, to me its more of a raspberry color, which I LOVE. The formula was flawless, Zoya has been spot on with their formulas lately! This is 2 coats. 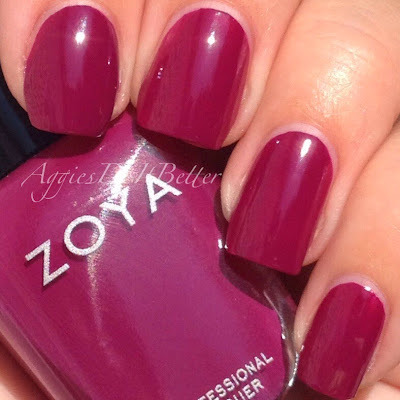 Next is Margo, which Zoya describes as "a modern red plum". Yep, I'll agree with that! In the pics you can really see the blue undertones but I thought in person it looks much more berry like. This is 2 coats. Excellent formula. Like buttah! 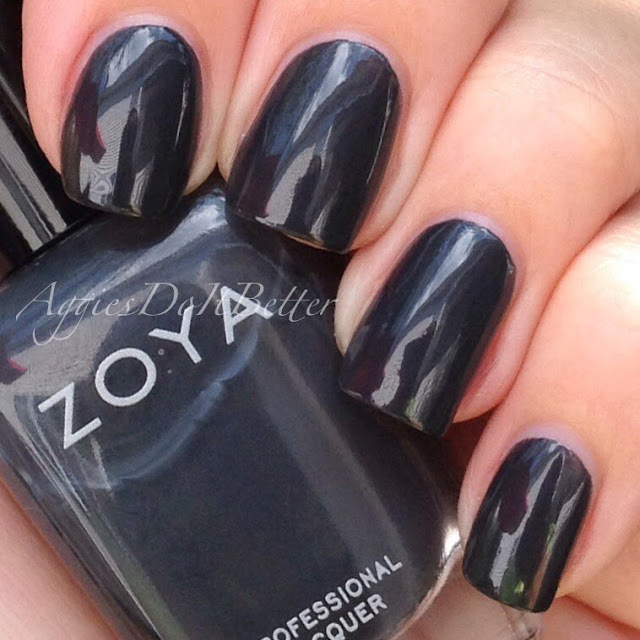 Next is Genevieve, which Zoya describes as a "cool leather gray". When I was wearing this my eyes kept going back and forth between a gunmetal gray and a really grayish slate blue. Either way, it's awesome. This is 2 coats. This Zoya Ryan, my obvious favorite of the bunch! I wanted to include this first pic because this is ONE COAT guys! 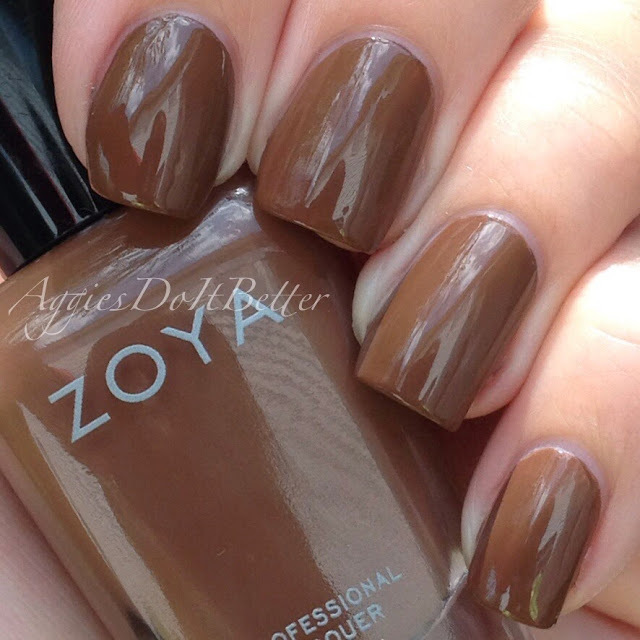 I put a second coat on my index finger for the bottle shot but that's it! 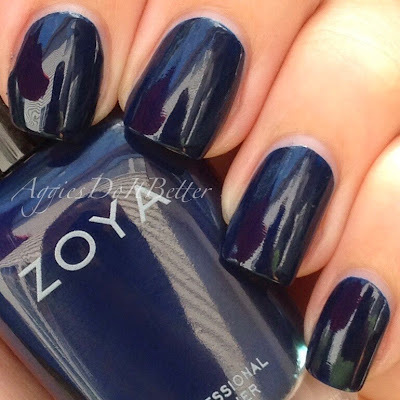 So here is Ryan, and here's the description from Zoya "Ryan by Zoya can be best described as a classic indigo in a flawless cream formula. (Originally released during NYFW for Timo Weiland's AW14 Collection" So it's a re-release? Not exactly sure about that? Either way, it's amaaaaaaaaaaaaazing. This pic is ONE COAT on all fingers except my index finger has 2. 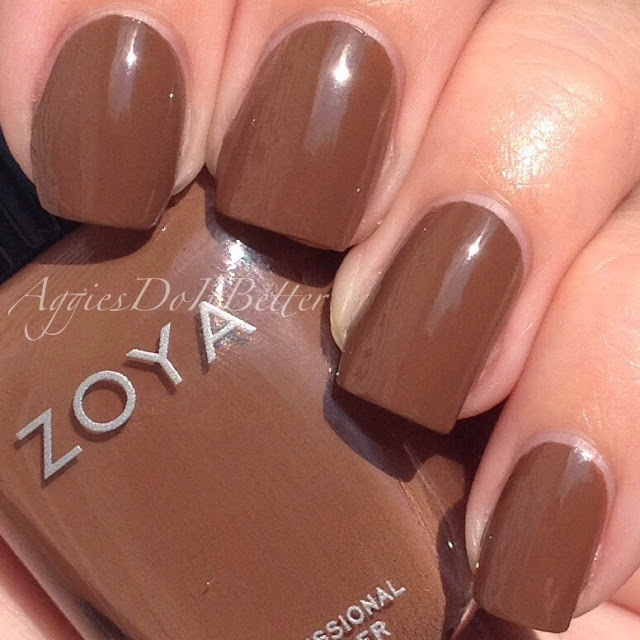 This is Nyssa, which Zoya calls a milk chocolate. Funny, that's how I described several of the browns from the fall Naturel2 Collection I reviewed this month. This shade falls right in between Chanelle and Emilia of that collection. All varying shades of chocolate, no problem with that here! Lastly, is Claire. 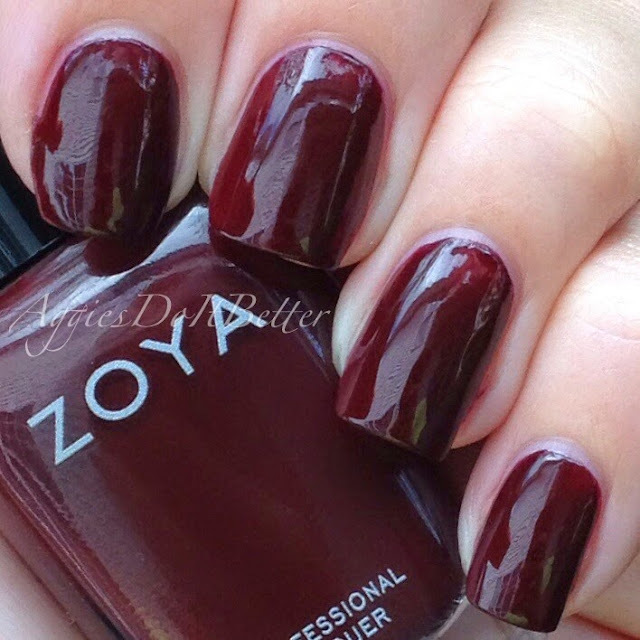 Zoya calls this a "warm, rich burgundy". 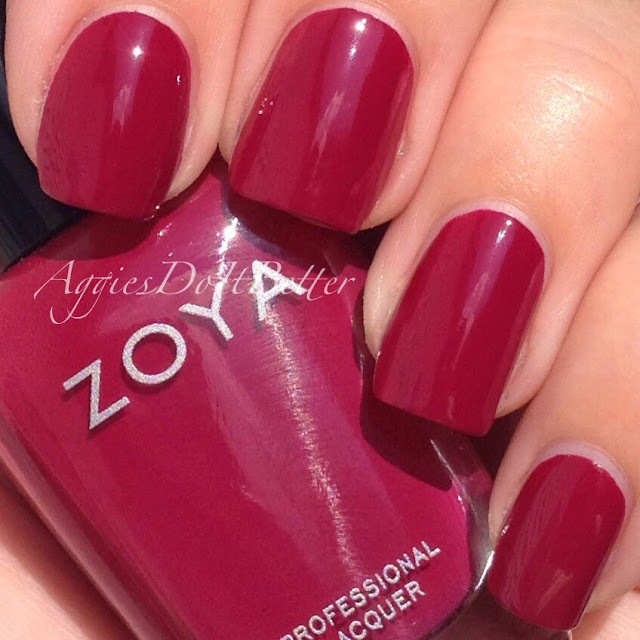 Yep, you got it, another flawless maroon from Zoya! 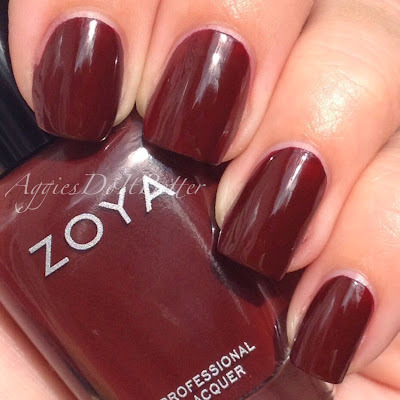 I really want to do a comparison of all my favorite maroon polishes across the board for all my Aggie brethren, would anyone like to see that?? 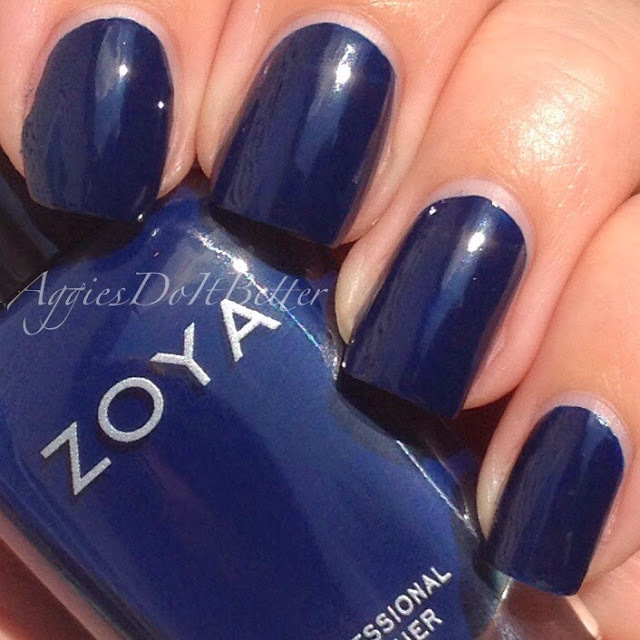 Claire is a touch lighter than Zoya Toni, in case you were wondering. The Zoya Entice collection was provided to me for my honest review, my opinions are my own, really! 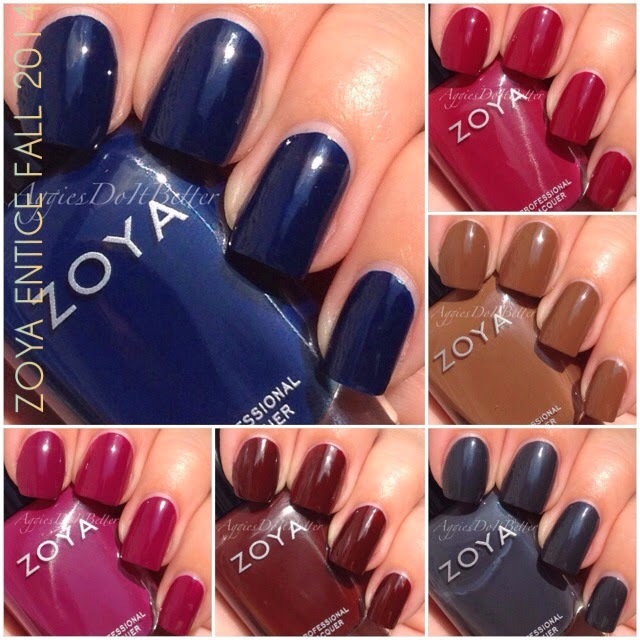 The entire Entice Collection is available now for $9 each HERE! That's a direct link, go ahead, check them out! 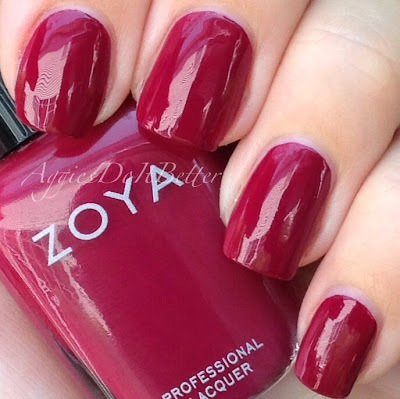 I love maroon polishes as well so I would love to see all your favorites since I only have a couple! I will have a full on Maroon post coming in the next month! I'm excited! !